Inside Transracial Adoption is the authoritative guide to navigating the challenges and issues that parents face when they a adopt a child of a different race or from a different culture. Drawing on research, the authors' decades of experience as adoption professionals, and their personal experience of adopting transracially, the book features real-life examples and strategies for success, and explores in depth the realities of raising a child transracially, whether in a multicultural or predominantly white community. Readers will learn how to help children build a strong sense of identity, so that they will feel at home both in their new family and in their racial group or culture of origin. This fully updated second edition also incorporates the latest research on positive racial identity and multicultural families, and reflects recent developments and trends in adoption. 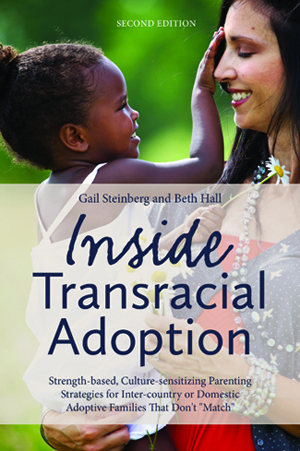 "Inside Transracial Adoption is the bible of resources on this subject and the book I most often recommend to anyone considering adoption, adoptees, and adoption professionals. There is wisdom for everyone who cares about transracial adoption and the children and adults who come together as transracial families." "Beth and Gail have once again provided adoptive parents with information, examples, and approaches that are both practical and useful... They have created a resources and overview of topics that can be used by agencies in preparing parents for transracial/cultural adoptions." *** When you order through Pact you will receive a signed copy of the book, with a personal note from Beth Hall, Pact’s Director and author ***.